Welcome once again to a spooky Candy Aisle Halloween review. 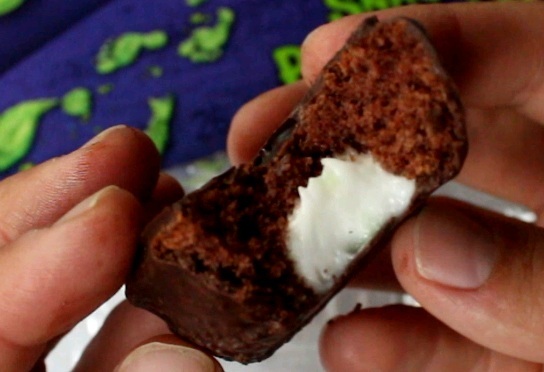 Today we've got a doozy of a chocolate to look at, its the surprising Cadbury Screme Egg Snack Cakes. If you haven't been following along, Cadbury has issued these limited edition versions of their standard chocolate and goo Creme Eggs (seen usually around Easter time), called the Screme Eggs. They are just like the regular eggs, only full of green goo, and packed in very awesome and spooky Halloween themed wrappers. I revied that here on the blog last week. But in addition to launching the limited edition Screme Eggs, Cadbury has also released these Screme Egg Snack Cakes! Totally off the wall you say? Well not entirely, Cadbury has been stepping into the snack cake market a bit. This is new though, and since its all for the love of Halloween I have to immediately give them props for trying something very new. Its a great idea, now lets just see if the cake itself is great. The design work here, as with the Screme Eggs themselves is top notch. The package shows us whats inside (always a plus). Looks like chocolate cake, surrounded by chocolate, and filled with both white frosting, and green goo. I'm surprised by a few things here. Firstly, is this the same goo that was found in the Screme Eggs? Why the frosting around the green? I expected the Screme Egg to have a white part, then green yolk, but was surprised to find it was in fact all green inside, why does a snack cake have more resemblance to an egg than the actual egg? Do any of these things really matter? No. I just wonder about stuff... like whose eerie glowing footprints are coming from the cake??? Is there some kind of monster that's hatched out of the egg? I thought the eggs themselves were the ones that had gone bad... very odd. I can tell I'm in some trtrouble from the warning splattered at the top. "Get them while you last" Thats pretty threatening stuff. Are these eggs / snack cakes going to attack me? Should I be looking out for some unknown monster with glowing gooey feet the assault me while I'm enjoying my snack? Where can I find out more answers to my questions? The back of the box has a full comic strip on it explaining the origins of the Screme Eggs... Well sort of explaining the origins. At first I scanned this comic and thought it was telling me that a meteor had crashed turning the eggs bad, but I think I must've been confused by the French. If you look at the comic properly (click on the pics below to embiggen) then you'll see that in fact no one knows what happened that night... But something happened to the eggs. Now these good eggs have gone bad They are Screme Eggs now and they are unstoppable! Jeepers creepers this is totally freaky stuff. I mean rampaging eggs out for.. . something. Should I be worried? Just look at these guys! They look like they're about to murder me and eat my soul! Terrifying. This is pretty much the most amazing origin story for a candy or chocolate bar ever. Why in the world hasn't anyone done this before? As you can see it doesn't take much, just four panels, and I'm hooked. I mean this is less story than your average level of Angry Birds and I am totally engrossed, I give MAJOR props to the graphic designers who thought this up, and to Cadbury for trying something new. Ok, thats enough fun and games though. The mood has been set, I'm sold. Lets get into the snack cake. Opening this box of 6 cakes I'm dissapointed to find that the individual cakes are wrapped in clear cellophane. Thats lame. I guess it explains why I couldn't find this item in a single cake pack, but I really wish they had a wrapper with at least some of these design elements on it as well. Here's the thing, if Cadbury is lucky, parents will be buying these for their kids to take in their lunches for school. I'm sorry if that's wrong, but who else eats snack cakes? Stoners maybe... Anyhow, a single serving of this would be great. Kids will be taking this to school and just trying to describe to their friends the awesomeness of the packaging on the box is not enough. I contend that if there was some version of the design on the individual wrappers then word of mouth would spread around the schoolyard like wildfire. Everyone would want to try the green goo. As it is, your childs snack will now probably be mistaken for a HoHo. (That's nothing to sneeze at for sure, but their futile attempts to describe the will certainly be lost on the masses). The snack cake one out of the wrapper looks pretty good. Its got a vaguely egg shaped design, fitting the theme. It smells very good, like all Cadbury chocolate, although this is more... cakey smelling I guess is the word. Lets just bite in and see what we've got. Ok, so this is interesting. The filling, as with any non disc or log shaped chocolate snack cake is bunched in a small area far in the belly of the beast, so your first engagement in the treat is cake and chocolate. The chocolate on the outside is fine, nothing special, its thin and comes off on your fingers when touched too much. This isn't a great attribute, but is a provlem with pretty much ever chocolate coated snack cake on the market so nothing I can really hold too strongly against Cadbury. The cake itself is the main element here, and overall its good, not great. Its very sweet, very chocolatey and perhaps just a touch too moist. Better too moist than dry for sure, but this isn't as fluffy as I would like and its slightly too sweet. Maybe a kid would dig the cake, but for me it goes a hair too far. On second bite we get into the frosting and goo. Surprisingly they seem to blend together. Could they be made from the same stuff? That seems unlikely right?! I imagine the white frosting is stabalizig the green sugar goo and holding it from absorbing into the cake too much, but maybe I'm wrong... No I'm not, its just hard to tell here because when biting into it the white frosting immediately mixes with the green goo into a single big mess in your mouth without much discernible difference in texture. The biggest impression is sugar. This is sweet, slightly too liquidy sugar / frosting mix. Not at all like the green center of the Screme Egg, although it does look similar. Its not bad, and if you like your snacks sweet, this definitely does the trick, but its not what I wanted. Overall this is a really interesting snack cake, it lives firmly on the level of good, but not great. Everyone will get a real kick out of the packing and design work on the box, but when it comes down to the cakes themselves, you could still do better with a HoHo. I give Cadbury some serious credit for even creating this thing. I'm very glad it exists, if only to show us, and other companies that some people are still being innovative out there. If you want to see more from Cadbury, you can check out their website http://www.cadbury.co.uk/, and please look forward to more Halloween reviews coming to the Candy Aisle soon!